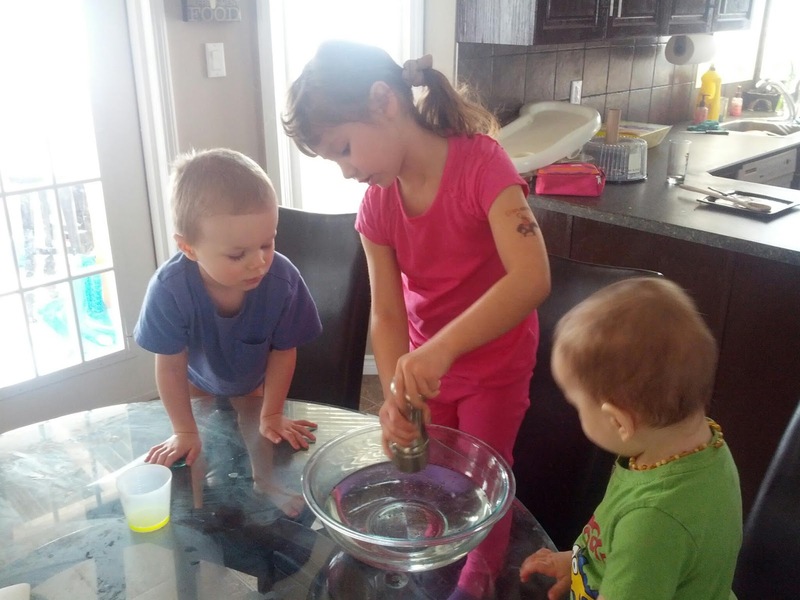 I came across this simple science experiment for preschoolers on Carrots Are Orange and just had to give it a try! 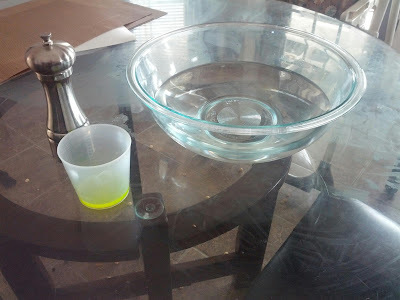 There's a good description on the original post about how it works, but here's the gist: when a finger is dipped in the dish soap and then placed in the pepper-covered water, the pepper will move away from the finger. My niece F was having a sleepover at our house all weekend, so I set up this simple experiment for all three kids to check out. 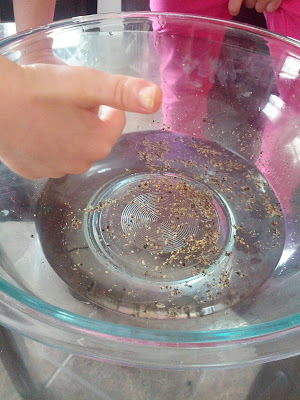 After explaining what the experiment was about, F started grinding up the pepper. I encouraged the kids to dip their fingers in the pepper water to see what would happen. F reported, "The pepper sticks to my finger." J was fascinated by the pepper, "Oooh, pepper!" And K...well...he soaked his hand in the pepper water and then licked it off his hands. A science experiment with a toddler isn't successful until the toddler tastes something. 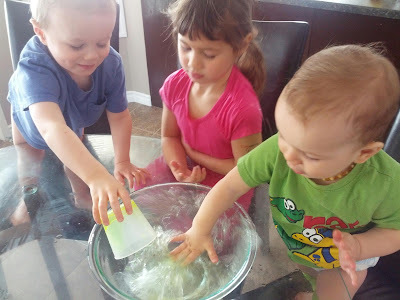 F and J then dipped their fingers in the dish soap and tested out what would happen now. The pepper will move away from the dish soap, as seen below, which F thought happened "because it's magic." The experiment didn't end there though. J dumped the rest of the dish soap into the bowl. 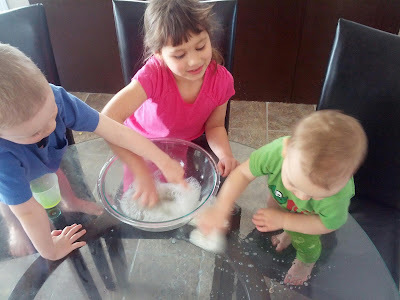 K then started using the mixture to clean the table, which was a bonus since the table was covered in little kid fingerprints. 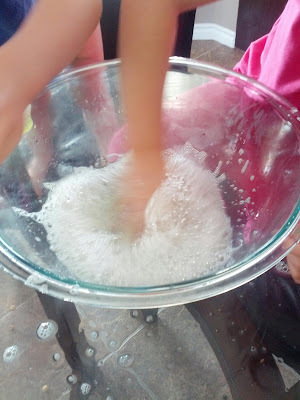 Then J and F mixed the soap and water vigorously to make some bubbles. 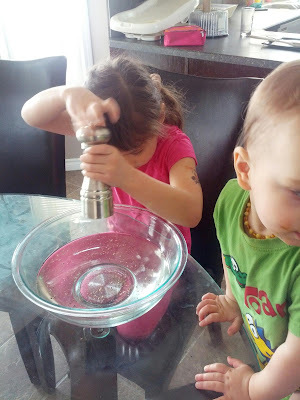 F informed me that this activity was, "A FUN activity!" and asked to do it again. Unfortunately, we were out of pepper so I guess we'll have to do it another day. Nice! I think science experiments for preschoolers should just be called magic tricks.